This early 1900’s woman sunbonnet has been one of my extra long time favorites. 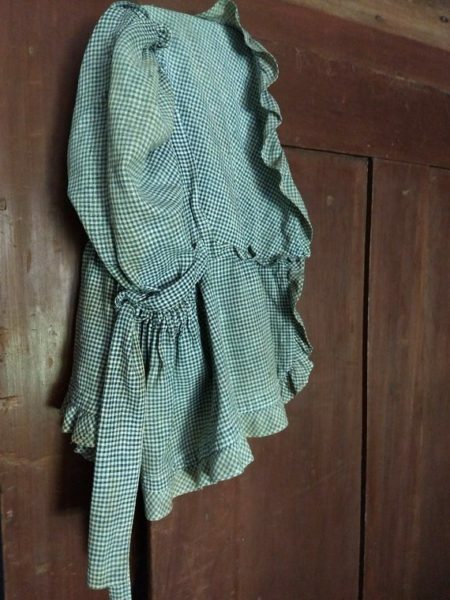 Made in a blue and white small check homespun, the bonnet features a narrow ruffle around the stitched flat brim. Another narrow ruffle gathers the back, along with the ties, which adjusts the fit at the back of neck line. A wider ruffle follows the edge of the apron of the bonnet. Inside chin ties to tighten the fit. The fabric is soft and worn with a mellow feel, giving it a wonderful patina.